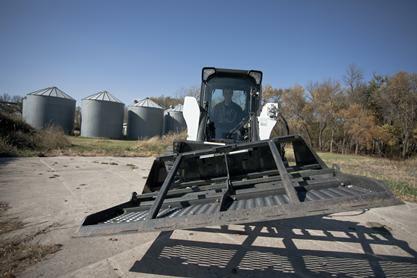 Get more work out of Bobcat® attachments with the Tilt-Tatch accessory, which connects as an interface between the carrier and non-hydraulic attachments. When operating, the Tilt-Tatch accessory allows the connected attachment to oscillate up to 15 degrees right or left, maximizing jobsite capabilities. Oscillation action of the Tilt-Tatch attachment is operated directly from the operator's seat, using hydraulic controls. The sturdy build of the Tilt-Tatch attachment is designed to fit a wide range of compact equipment. It is the ideal attachment when looking to extend the jobsite capabilities of Bobcat attachments. And it is a must-have attachment for any landscaping or construction contractor. Load or unload pallets of materials such as lumber, shingles, siding, fencing, and block. Hydraulic Controls: For maximum operator comfort, oscillation action of the Tilt-Tatch is hydraulically controlled directly from the operator's seat. Oscillation: When operating with the Tilt-Tatch interface, non-hydraulic attachments can oscillate 15 degrees right or left, maximizing jobsite capabilities.